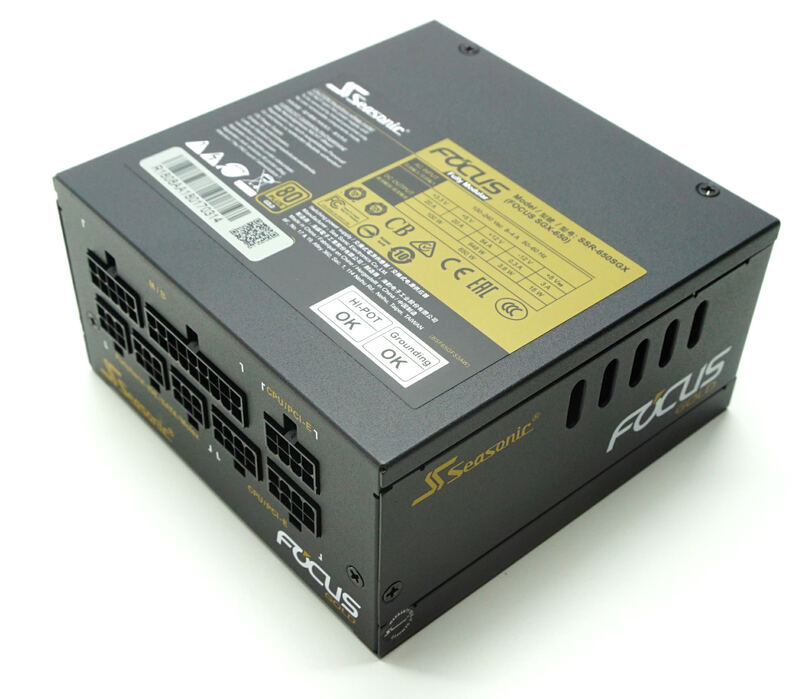 One of the major drawbacks that SFX PSUs have is that 120 mm fans do not fit into the standard 125 × 63.5 × 100 mm / 4.92 × 2.5 × 3.94 in (W×H×D) SFX form factor. 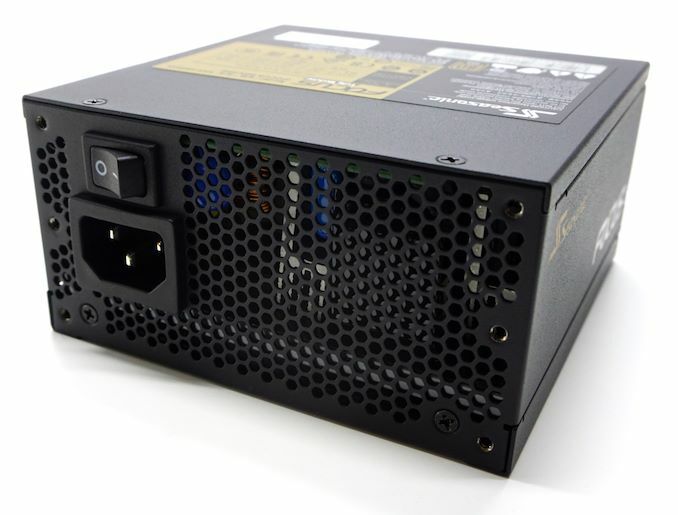 Opting to go with a 1200mm anyhow, SeaSonic has lengthened the chassis slightly, so the Focus Gold SGX-650 measures 25 mm longer than a standard SFX PSU. Although that does not sound like a huge difference, it could cause compatibility problems with compact cases that can only fit standard-sized SFX PSU. 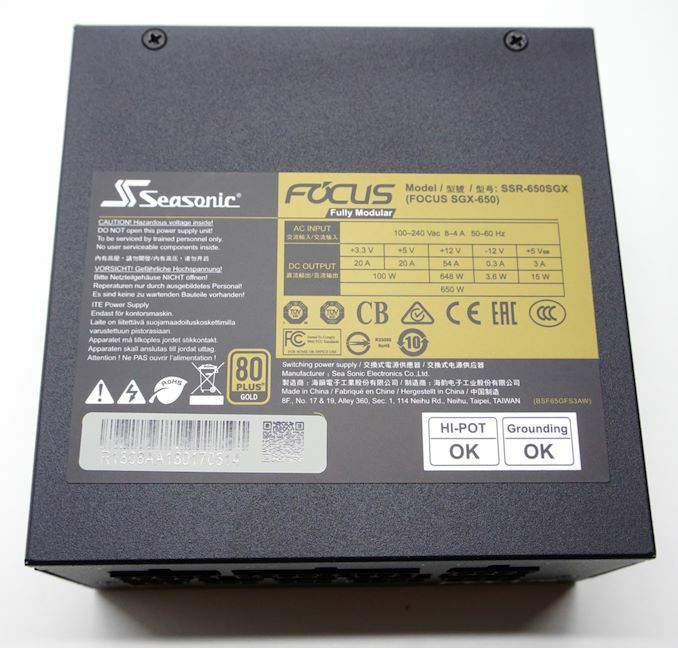 SeaSonic sprayed the chassis of the Focus Gold SGX-650 with a matte black paint. The series and company logos are sprayed on every side of the PSU in white and gold colors, except from the top side of the unit where a large sticker with its electrical specifications and certifications lies. The bottom part of the chassis forms a unique finger guard for the slim 120 mm fan hidden beneath it, with the company logo on a metallic badge right above where the fan’s engine is. 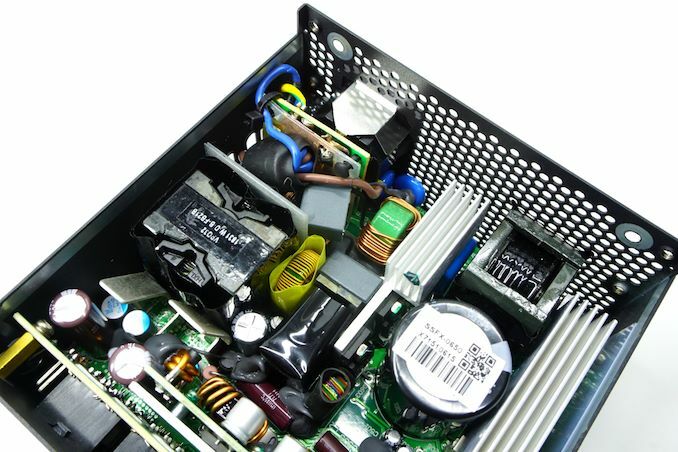 Despite the compact dimensions of the unit, the designer managed to place a small on/off switch next to the AC cable receptacle on the rear side of the PSU. The front side is much more interesting, housing the connectors for the modular cables. SeaSonic did not color-code the connectors, but they have a basic legend printed on the chassis that indicates where each connector goes. Besides, it is practically impossible for a user to insert a cable into the wrong connector, as each cable type has a different connector and the connectors are keyed. 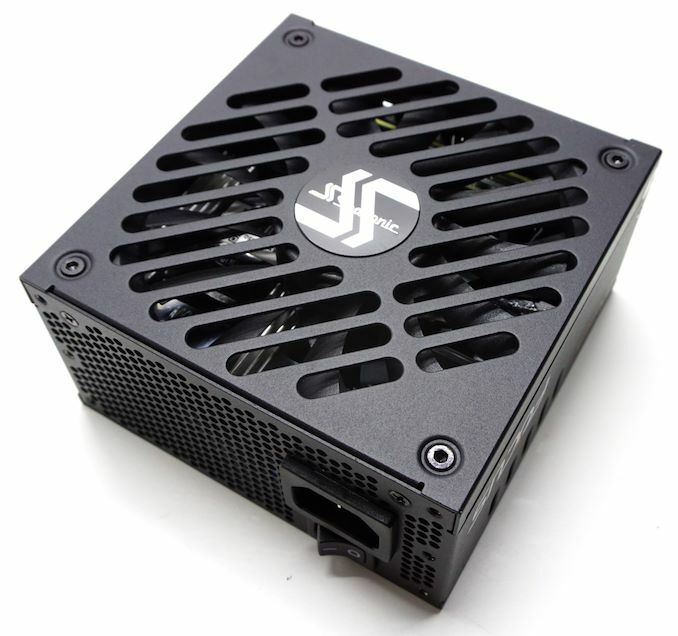 SeaSonic entrusted the cooling of their most powerful SFX PSU to Globe, a very popular manufacturer of quality cooling fans. 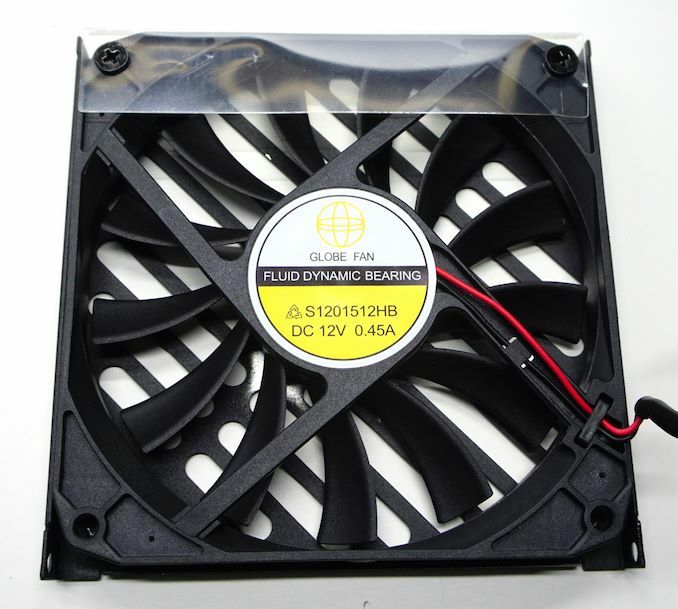 The 120 mm low-profile fan of the SGX-650 has a fluid dynamic bearing (FDB) and is actually rather powerful, with a theoretical maximum speed of 2200 RPM. It should never reach that high a speed under normal operating conditions, but the safety overhead is more than welcome. Note that the fan’s model number also refers to a regular sleeve bearing model but this indeed is an FDB bearing fan, with Globe causing quite the confusion by not changing the model’s code. We need not check the OEM of this unit as SeaSonic obviously designed it, developed it, and built it themselves. 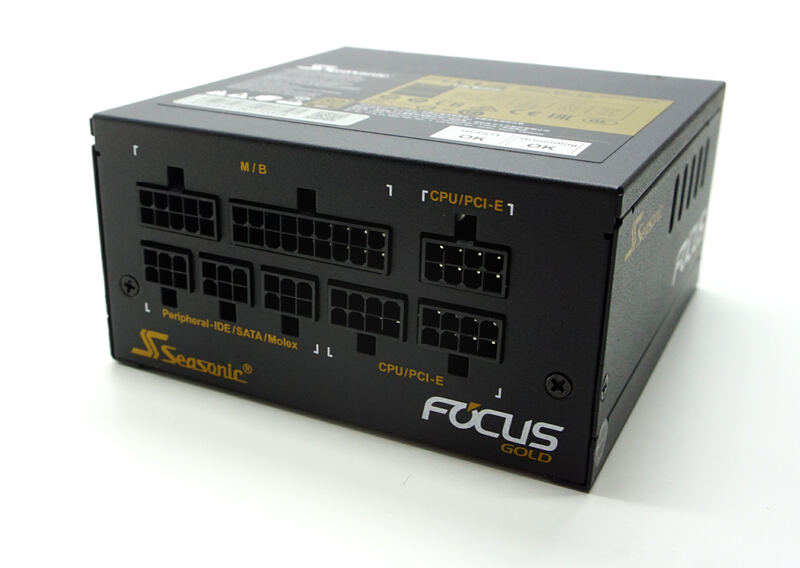 Despite the relatively high power rating and the compact size of the chassis, the interior of the SeaSonic Focus Gold SGX-650 isn't all that densely packed. The filtering stage starts on a secondary PCB that is soldered on the back of the AC receptacle. It is a textbook design with four Y capacitors, two X capacitors, and two filtering inductors in total. The placement of the filtering stage components is a bit too tight, with the designer forced to raise one of the X capacitors, as it obviously would not fit in between of the other components. 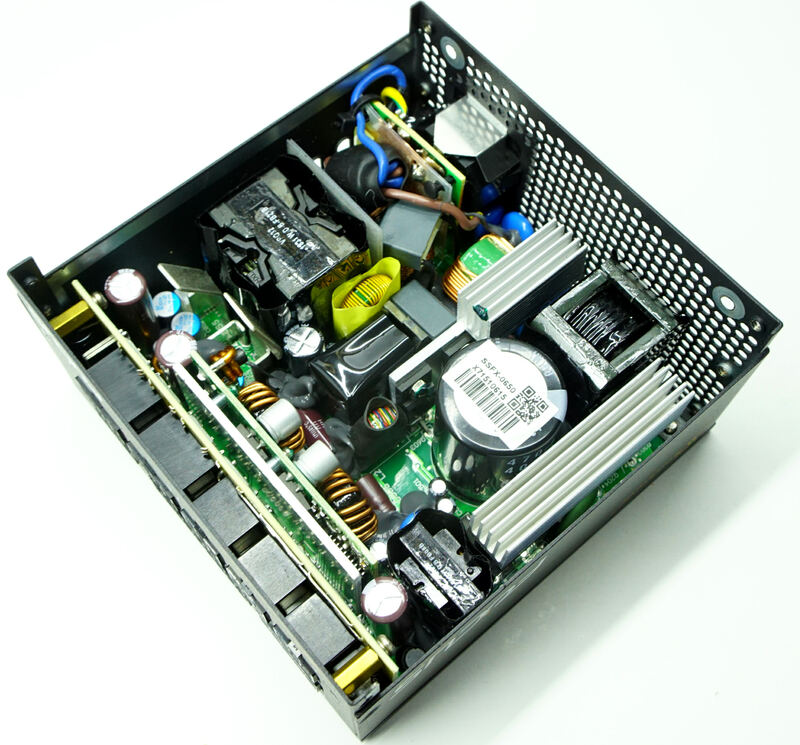 There is only one bridge rectifier, which is sharing its heatsink with the primary side inversion MOSFETs. 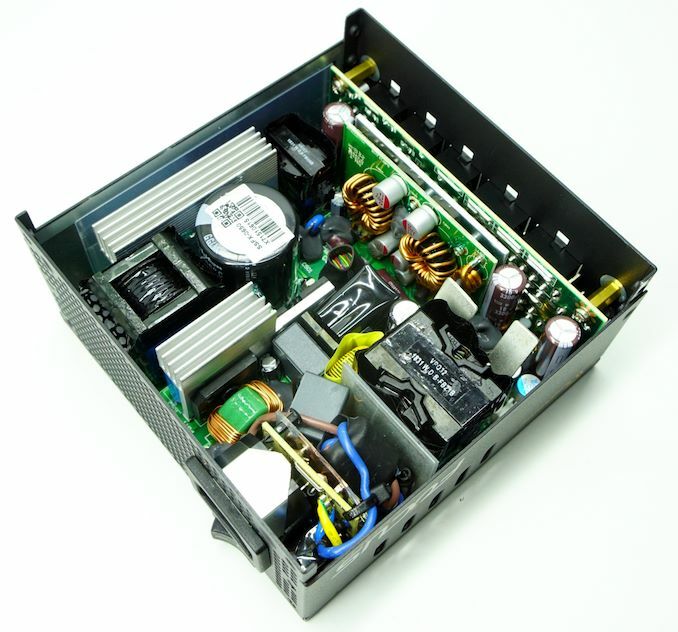 The APFC circuit is also a textbook design, with the active components on the large heatsink across the edge of the PCB, one enclosed filtering coil and a single capacitor. Meanwhile the Nichicon-made capacitor is surprisingly huge for a PSU of this size and power rating, with SeaSonic using a 400V/470μF cap. There are two primary side inversion MOSFETs that form the heart of an LLC resonant half-bridge design. 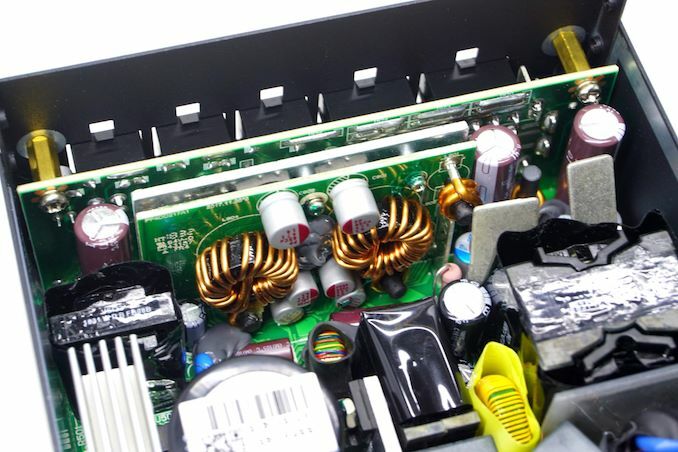 On the secondary side of the PSU we find a small heatsink with no components visibly attached to it; this is one of SeaSonic’s standard techniques to place the secondary side MOSFETs underneath the main PCB and thermally connect them to the chassis of the PSU, improving their cooling. A vertical PCB holds the DC-to-DC converters for the 5V and 3.3V voltage lines, supported by a modest heatsink. 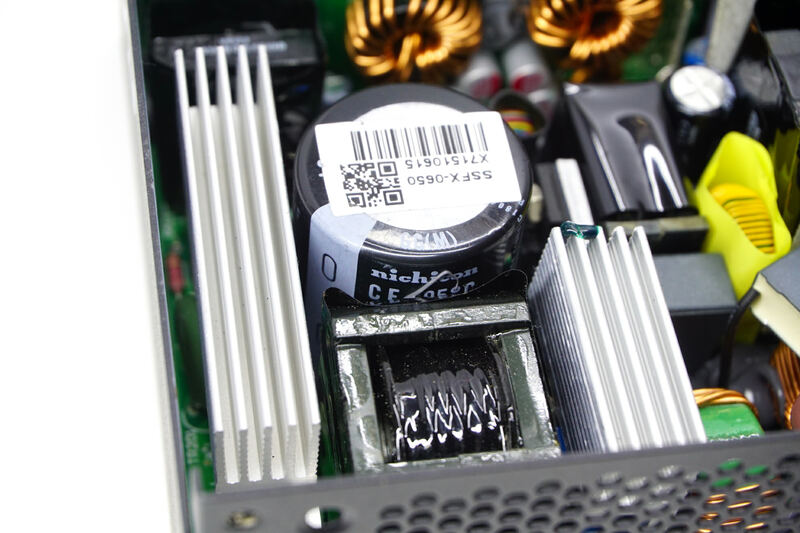 Nippon Chemi-Con supplies all of the electrolytic capacitors of the SeaSonic Focus Gold SGX-650. The polymer capacitors are coming from both Nippon Chemi-Con and Nichicon, making the PSU an all-Japanese affair.